A hidden gem in Asheville, North Carolina goes by the name Dwellings. It's a home store on a small side street in Biltmore Village that offers oodles and oodles of scrumptious design. Today, I'm going to focus on one of the five vendors in the space, Susan Chancey of Lost & Foundry. You may remember her from the entry I did on Screen Door. She continues her design prowess inside Dwellings, but here she has freedom to be a little riskier. Susan, "It's like a science experiment for me as it allows me to express my taste more, push the envelope a bit more." Susan calls this, "My pretty space." And in just 600 square feet, she offers endless inspiration for our own homes. 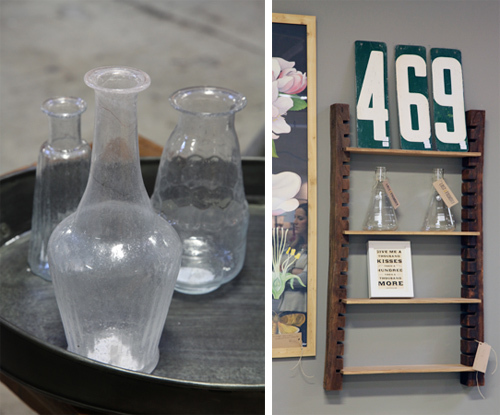 It's a mix of industrial, fanciful and edgy or as she describes it, "crisp, modern vintage." As it's a popular space, her wares are constantly in flux. Which makes it fun for visitors who like to check in to see what's new and exciting in design. The one unifying element in Susan's space is lots and lots of pillows. Some are pretty and fabulous while others are quirky and fabulous. She is very conscious of her price points as all of her pillows are under $100. I particularly love the two deers dancing a sophisticated dance... Find here at Spitfire Girl. Susan offers a few Kantha quilts she currently covets as well as these amazing industrial mirrors. She had found this cog in a warehouse in Philadelphia and along with the help of Robert Ogden, crafted unique and appealing pieces. Susan offers some great tables too. The one to the top left was a barn door she found at a yard sale in Asheville and had fashioned into a table. The one with built in swivel seats is an amazing piece (and one she has the mold to). It's refabricated from the original tables of the TastyKake factories in Philadelphia. Made of heavy cast iron and reclaimed wood, this table will endure as a very cool and unique conversation piece. *Next time you're in Asheville, be sure to stop in to see what Susan has gathered at her Lost & Foundry locations of Dwellings and Screen Door.